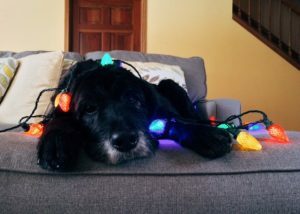 Animals may not have to deal with Christmas cards and the stress of finding the perfect gifts, but they feel the pressure of the holiday season, too. Between Thanksgiving and New Year’s, Americans throw out 25 percent more trash than the rest of year. Increased travel means more greenhouse gas emissions. Many holiday feasts traditionally feature meat dishes. And although your pets may enjoy extra treats and having more people around, decorations and parties can be full of potential hazards. 1) Give the gift of vegan food. Holiday eating doesn’t have to be all about turkey, ham, egg nog, and other foods that harm animals and the planet. In fact, there are tons of opportunities to share delicious, animal-friendly foods with others, from hosting plant-based meals to bringing vegan cookies to the office party. Share your favorite recipes with friends and family, and help create new traditions with dishes that benefit farmed animals and wildlife. 2) Give experiences instead of stuff. Americans spend $16 billion on unwanted gifts. That’s not just a waste of money, but also a waste of all of the resources that went into those gifts, not to mention their packaging and wrapping paper. And if those gifts wind up in the trash, they keep on posing threats to wild animals. So instead of giving forgettable gifts that come with a steep price tag for wildlife, give the gift of experiences that will create new memories with your loved ones. Bonus points if those experiences help animals, such as a vegan cooking class, a volunteer day at a farm sanctuary, or a hike in your favorite wilderness. 3) Give your pets what they really want. Most of us think of our dogs and cats as part of the family, so when it comes to holiday shopping, they tend to get caught up in the frenzy of gifts. But your animals don’t care about a big pile of red and green toys under the tree. Their wish list is much simpler — they want to spend time with you. Take some time away from the holiday rush to play with your cat, take your dog for long walks, and give them quality time instead of cheap toys or rich holiday treats that might make them sick. 4) Give wildlife decorations they can enjoy. Try decorating an outdoor tree for wildlife with ornaments made of birdseed and popcorn garland. Tinsel and plastic decorations can become choking hazards for wild animals (as well as the animals in your house), so opt for simple, meaningful ornaments indoors that you can reuse every year to cut back on waste and pollution. If you get a live tree for your house, look for an organic one to avoid the heavy pesticide use that often comes with growing “perfect” Christmas trees. 5) Give to animal charities. If you’re able to donate to charities that help animals, now’s the time to dust off your checkbook or donate online. This is the time of year when nonprofits count on a big chunk of their annual budgets coming in through holiday and end-of-year gifts. Donations in honor of your loved ones to charities that help their favorite animals make great gifts. And, if you have time to give, find out if your favorite animal nonprofit could use some extra help. By supporting animal charities during the season of giving, you can help them continue their life-saving work year-round. For more holiday tips, check out THE ANIMAL LOVER’S GUIDE TO CHANGING THE WORLD.